DULLES, Va.Oct. 19, 2015-- Orbital ATK (NYSE: OA), a global leader in aerospace and defense technologies, announced today that it has successfully completed the final validation and testing for its new clean air Ramjet Test Facility at the Allegany Ballistics Laboratory (ABL) in Rocket Center, West Virginia. This facility is one of few in the United States with a clear-air testing environment for flying trajectories on the stand with real-time, variable mass flow-rate and temperature. ABL is housed at the site owned by Naval Sea Systems Command, which committed funding to the new facility. 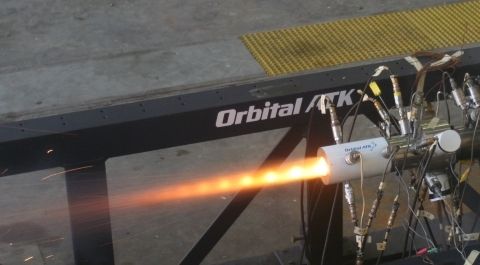 Orbital ATK s Ramjet Test Facility accurately replicates the operational envelope of tactical air-breathing solid propulsion systems with air mass flow simulating up to Mach 4.5 and temperatures up to 1,500 degrees Fahrenheit. This facility provides real-world simulation with a clean-air environment free of combustion byproducts. This new facility is a national asset, providing the means to test next generation missile propulsion components, said Pat Nolan, Vice President and General Manager of Orbital ATK s Missile Products Division of the Defense Systems Group. We have the ability to fly a mission during test, which reduces costs associated with conducting multiple point tests. This new facility complements Orbital ATK s already extensive scramjet test capabilities, highlighted by its Aerothermal Research and Test facility in Ronkonkoma, New York, specializing in advanced development and validation of hypersonic systems. Orbital ATK is a global leader in aerospace and defense technologies. The company designs, builds and delivers space, defense and aviation systems for customers around the world, both as a prime contractor and merchant supplier. Its main products include launch vehicles and related propulsion systems; missile products, subsystems and defense electronics; precision weapons, armament systems and ammunition; satellites and associated space components and services; and advanced aerospace structures. Headquartered in Dulles, Virginia, Orbital ATK employs more than 12,000 people in 18 states across the United States and in several international locations. For more information, visit www.orbitalatk.com.